Sorry about the Radio Silence at Eau Brink Studio in the past week. This is due to my lovely neighbour ending up needing a great deal of support. I have also been making many things for Wymondham and Long Sutton. However in the background I have been busy. There is now a new email address which we hope will not end up in your spam. It is [email protected] i will be testing it later today so please take a look if you are on my emailing list. The lovely guys have also resolved the website issues including the booking problem. Now that the weather has turned we have loads more to do with the animals. The lambs will be gone from this week. She looks so small compared to what she looks like now. A new Ram will be introduced to the ladies for a short while. I hope they like him as much as they liked conkers. The chickens have not been laying but they will be back on track very soon. Next year we will have to get a new cockerel as we no longer have one. The ducks are happy now that the rains have come and started to fill up the pond. No eggs though. The bees are still flying but have enough honey to see them through the winter. And I do have to thank them for a small share of that crop. And I cannot miss out Marlow. he still lays on his bed n the studio enjoying the sun as it streams through the window. A strategic position that is vital for him to be able to meet and greet all visitors in the hope of a treat or two. Just a quick note to ask you to take a look at the King’s Lynn Embroidery Guild on Facebook. Please like the page and share it for others to look at. There is a great varied programme so something for everyone. Come along and enjoy and evening with us at South Wootton village Hall on Wednesday 31st October. 7.30 till 9.30 pm. This week and next at Eau Brink Studio. What have we been up to then? Apart from making items to see that is. Running successful Airbnb experiences. I am amazed at how many people want to book through Airbnb for their play days. 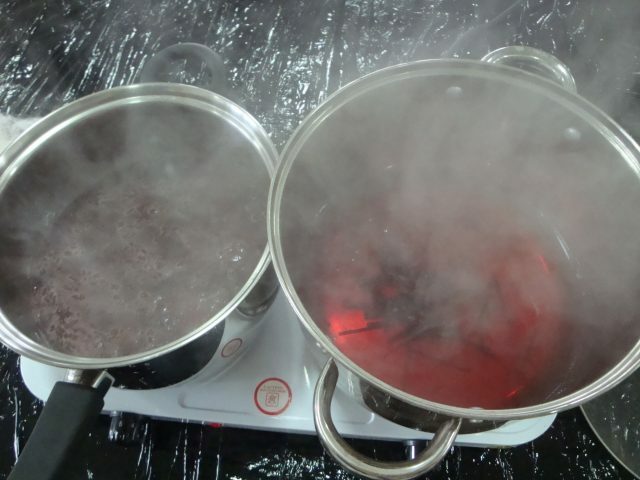 This week was all about dyeing with Acid dyes. A great day full of bright colours. 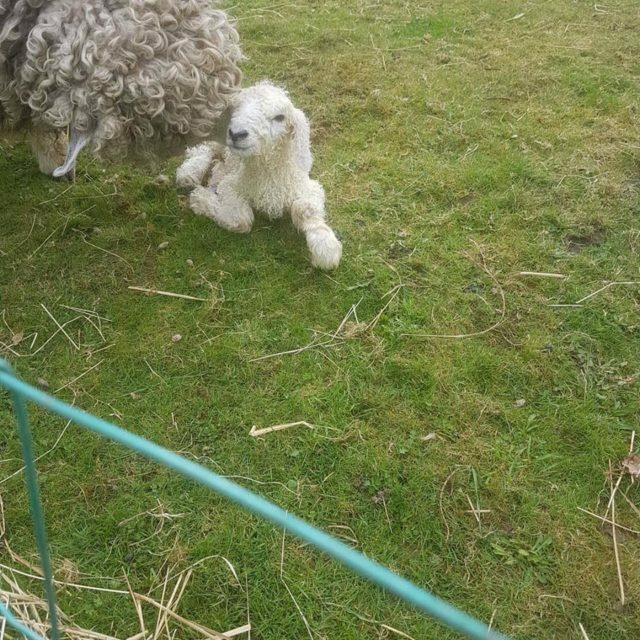 Everybody enjoyed their day and took home a huge amount of finished fleece. Some even bought yarn they had spun to dye. This encouraged a great debate on how to spin your yarn as well as if its best to dye it first. The outcome of this debate was of course what ever suits you. In school this week the children made spooky decorations including bat garlands. The aim of the day was to improve scissor skills. 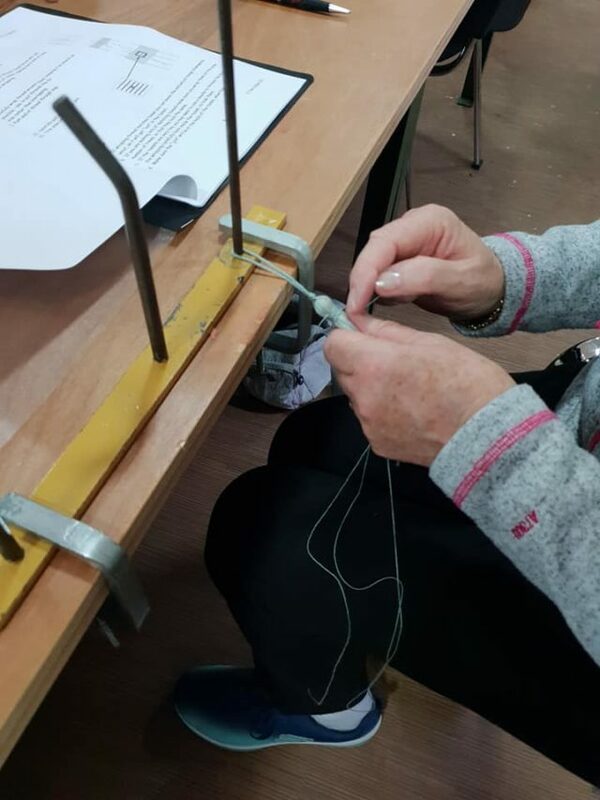 The week ended with the King’s Lynn Embroidery Guild workshop with Moira Neale. Stitching quirky faces. Everybody managed to finish a face and they were all very different. We started the day worrying about the drawing side of it but found that it was not a problem. the quirkier the better for this one. 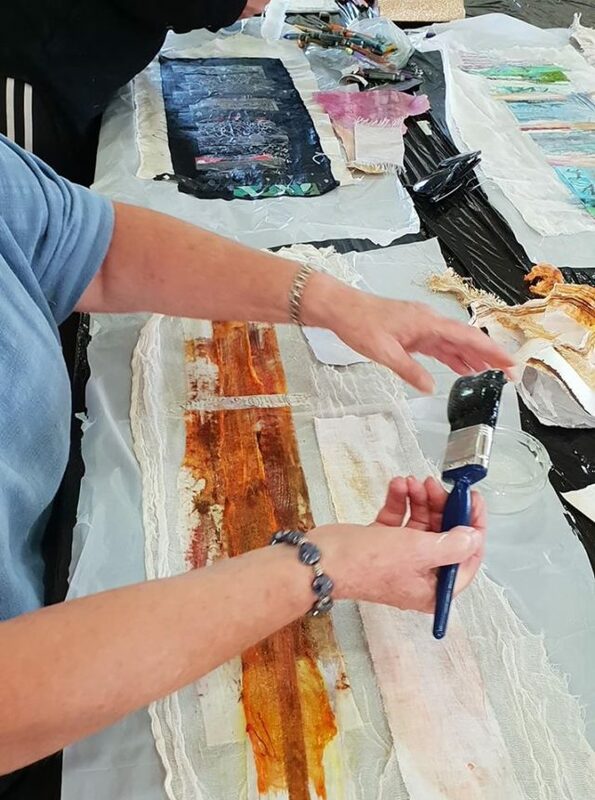 Moira will be attending the King’s Lynn Embroiderers guild on the 29th May 2019 to talk to us about an old cotton sheet? It will be fascinating to see what she is going to tell us she made from the sheet. 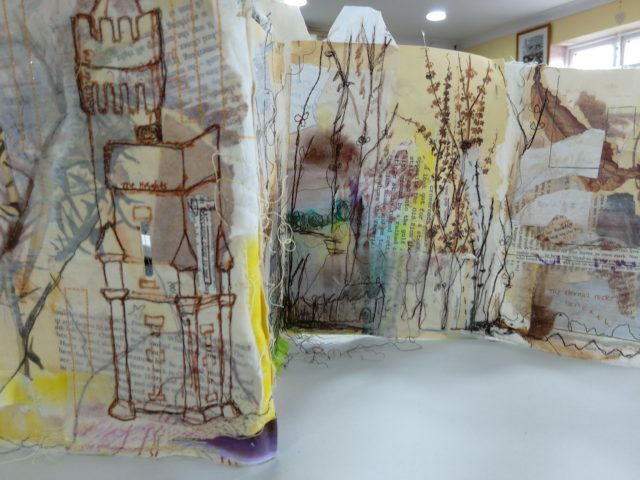 Next week is the Wymondahm Makers Art and Craft Exhibition. Why not come along and take a look at the fantastic items on offer. It opens on Tuesday the 23rd October and ends on Sunday 4th November. And whilst your in Wymondham why not call in to The Big C for some supplies? On a more personal note. 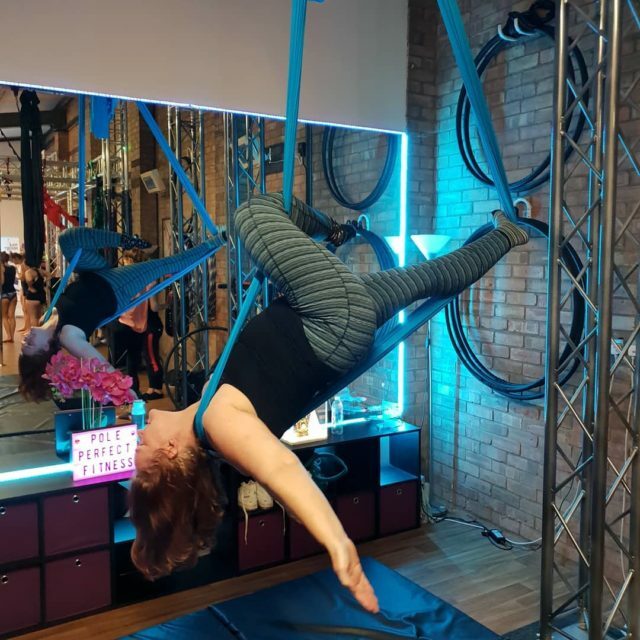 this week I managed to master a new move in Aerial Slings. I love this type of exercise as it challenges me as well as makes me fitter and stronger. It really helps with those aches and pains. 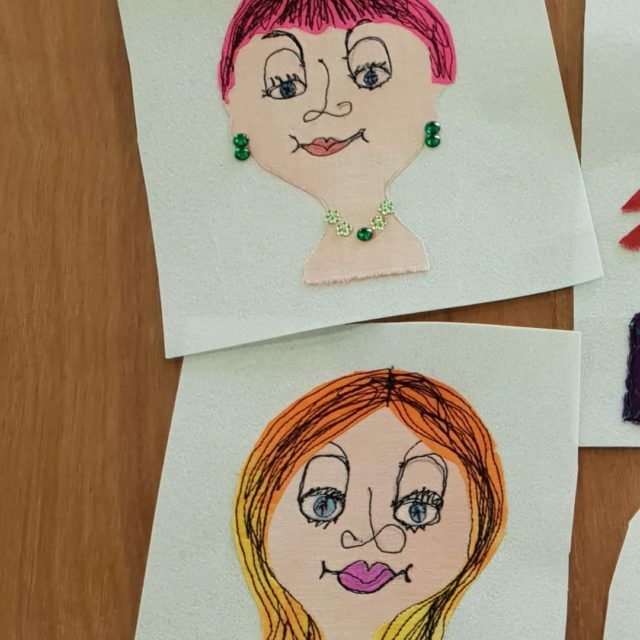 For those of you who are part of the Embroiderers Guild or want to join the King’s Lynn Branch why not pop over to the Facebook Page and have a snoop around. It is being updated this week so you may see lots of posts initially but it will then calm down to only a few a week. Passementerie is a beautiful old craft that is now on the The Radcliffe Red List of Endangered Crafts. Luckily for us Clare Hedges is a local lady who is an expert in the art. 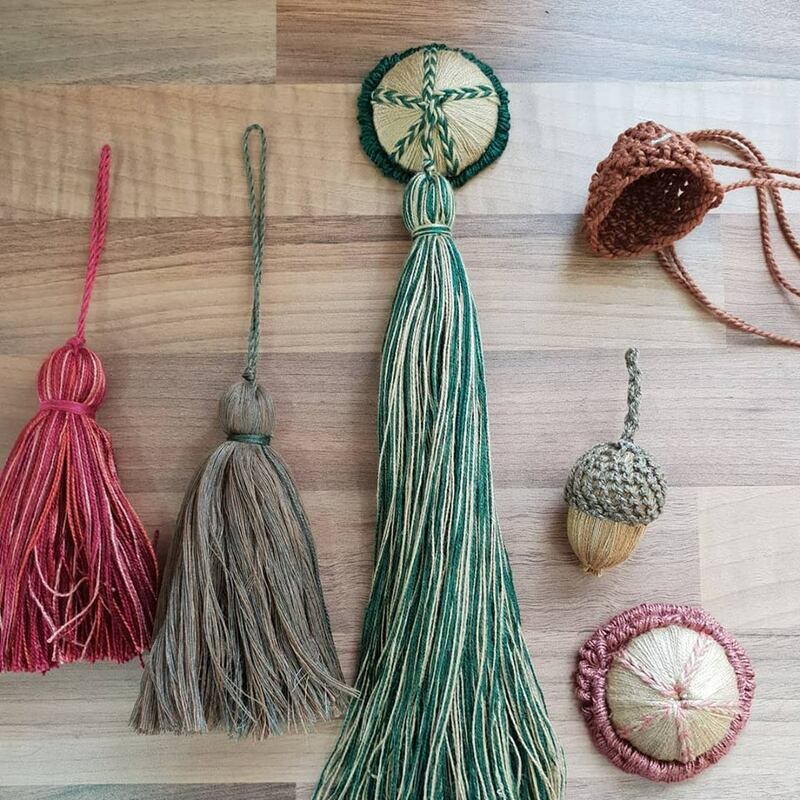 This weekend we learnt how to make tassels, covered buttons And an Acorn. Although not perfect my first attempt at the more complicated button covering was not too bad. Making a ruff however, is a different story. Besides needing several hands to do to this. What is affectionately known as the third hand is key to this procedure when first learning it. the third hand is basically three prongs on a base where you can tie your fibres onto it to help hold them as you work. Concentration is key till you get it. We were all please with the progress we made and the items we had finished in time to take them home. The general consensus was that we want Clare to return to teach us more. We are planning for Clare to return for a Christmas decoration workshop this year. This will be a one day workshop at the end of November. Then another two day workshop in the new year learning yet more new techniques which is great as that means that more learners can attend as we are all going to be starting from the beginning. There will be a few changes to the programme very soon so keep an eye out. The first one will be changes to the Experimental Wednesdays. Instead of four a month I am changing it to two a month. the same will apply to the Powertex Thursdays. I am hoping to Make some changes to Mondays too. Just waiting to confirm that one. I have decided to not do so many fairs and to concentrate on workshops for the studio with some new tutors especailly at weekends. Easy. You have been asking me to put on more workshops at weekends. For those of you on the mailing list you will be the first to know. If your reading this and want to sign up You can do through email at [email protected] or go to www.eaubrinkstudio.co.uk and sign up there. 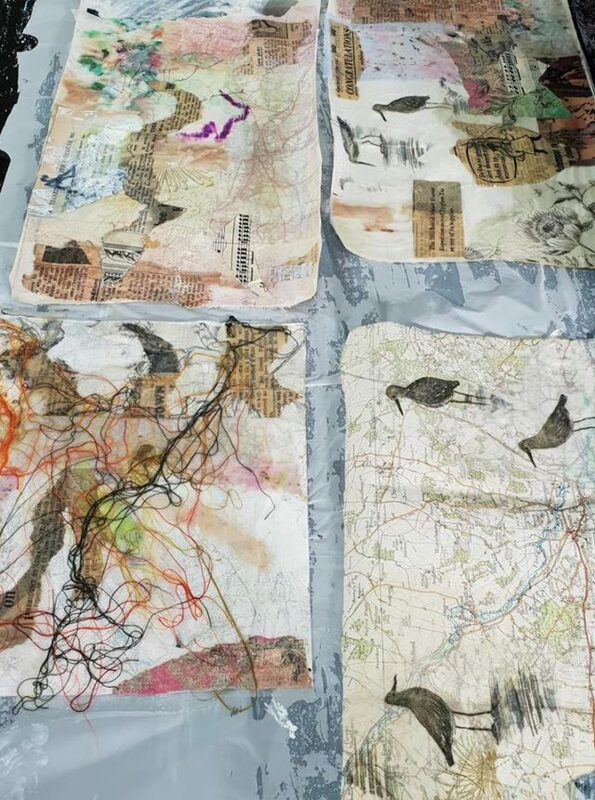 Cas Holmes – Images and Narrative in Textiles Restructured AT Eau Brink Studio over the weekend. Friday was a frenzy of preparation before collecting Cas from the train station in the evening. Early start on Saturday where cakes were baked whilst Cas organised how she wanted the studio set up. Enabling her to teach and demonstrate her processes to the students for the day. by nine o’clock we were ready. A good job as well as the first students started to arrive at nine fifteen. We were not told what to aim for or how to finish our work at the beginning. One of the main worries was what to aim for but that would have stilted our flow of creativity. 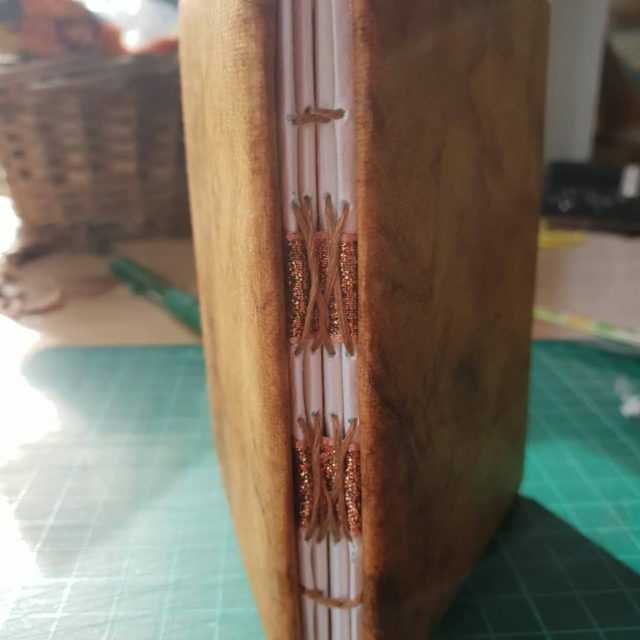 Cas did inform us that we were going to be using our found materials to create a book but not in the sense of a traditional book with a cover and pages that all fit neatly into the bound cover. 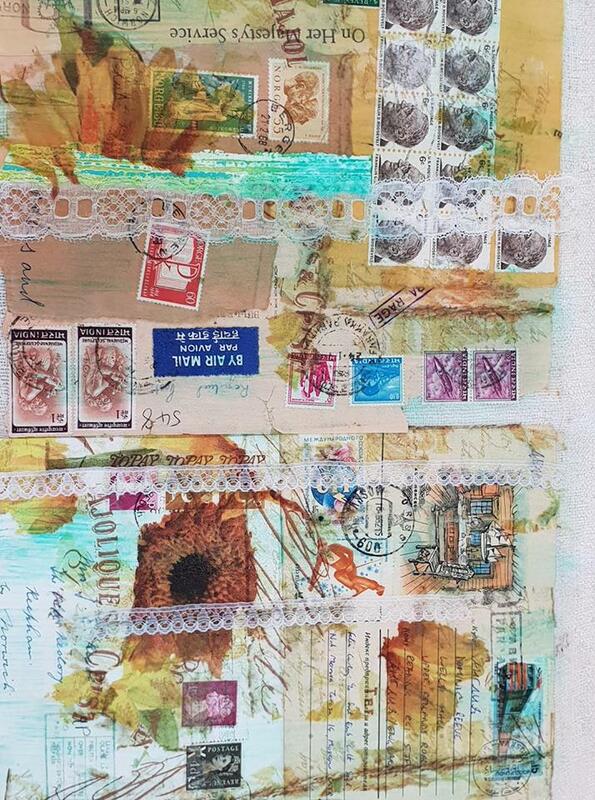 This piece is in progress using the found materials, mark making and art materials. At the beginning of the first day Cas broke the ice by getting the students to select a piece of paper and fold it then write their name on it before passing it onto the next person. This helped introduce the students to each other and get them to converse. 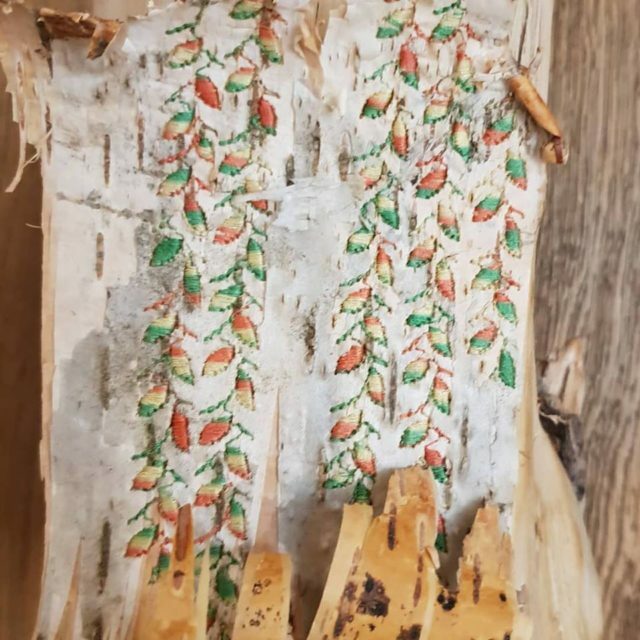 As the pages were passed on each time a different fold and different marks were added. This then could be used for the first page or for the cover of the book if desired. Throughout the two days Cas brought us back to her table periodically to demonstrate her processes. Encouraging us to be brave and use colour and line from the substrate to extend the shapes in a way that enhances our work. And if you don not like it change it. 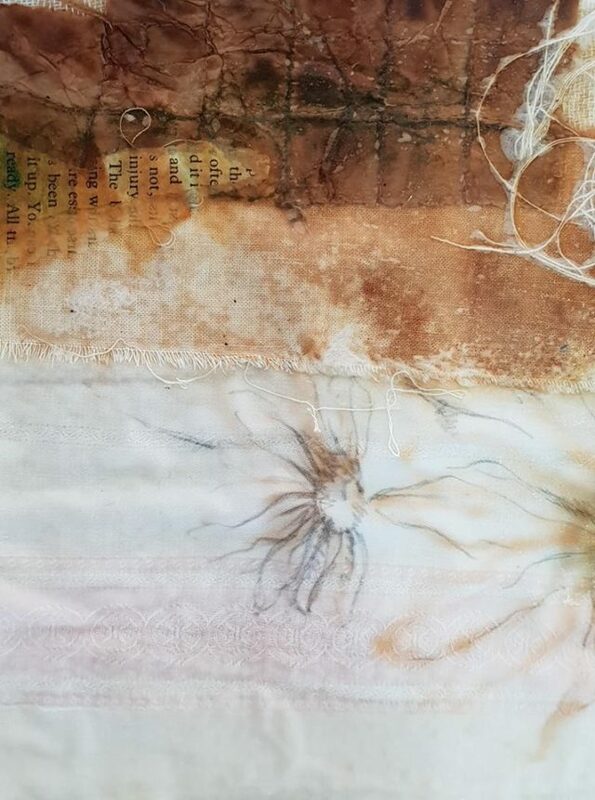 Layers were added to a fabric backing to help hold them together using CMC paste. The paste gives you the flexibility to make changes as you work as it is not permanent. This flexibility is great when wanting to take items off the piece or to move them to another area. You can continue to move pieces around right up to the time you start sewing. This helps your work develop organically. A way I love to work. For some of the students this was a totally new way of working and they found it a challenge as they were used to planning each stage of their work. Others wanted to explore each process further but that can take time. Extending colour from the materials used by adding water based ink or paints helps to bring in tones as well as blocks of colour. Drawing into the piece helps with keeping it interesting with subtle drawings and outlines. These can be stitched into at a later time either by hand or by machine. Cas pointed out to us that stitching is an art form using a needle instead of paint or pencils. A debate then commenced about why the art world did not like to recognise stitch as a form of art. A big subject. Once we were happy with the pages of our book and we had worked our covers it was time to think about putting it together. Something we did overnight as the work dried. Day two was all about the sewing. Cas demonstrated how to set up a sewing machine for free motion embroider. And pointed out that we had to remember that the needle is our new drawing tool. 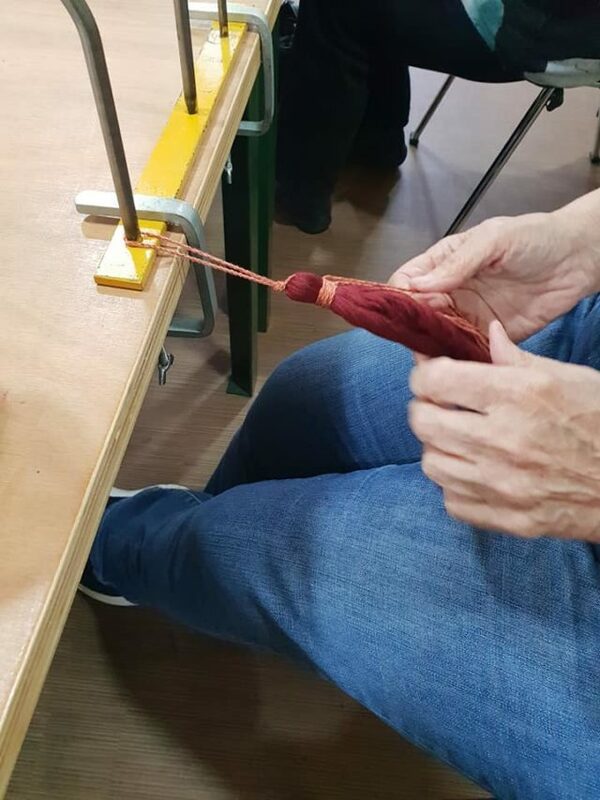 Everyone had their own favorite sewing machine and this led to a discussion on how the different machines performed especially when used for free motion embroidery. Once we had finished using the sewing machines to add stitch and texture we moved onto hand stitch. Even at this late stage you can add and remove layers. 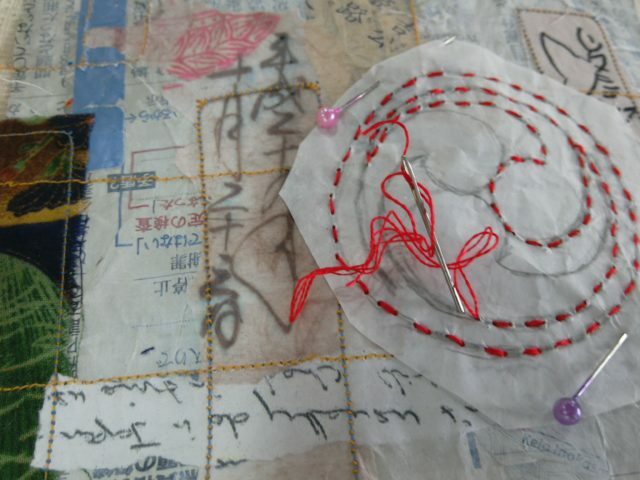 Stitching through paper works wonderfully if you want to get a specific design onto your piece. Then just pull the paper away. At the end of the workshop we spend thirty minutes discussing how we felt about our work and what we liked about the process. Cas encouraged each and everyone of use to critique our own work and to take on board what others said about it. It turned out that many of us were not that confident about our work and this process helped us see what others saw in our work. This gave us the confidence to continue working into it once home. 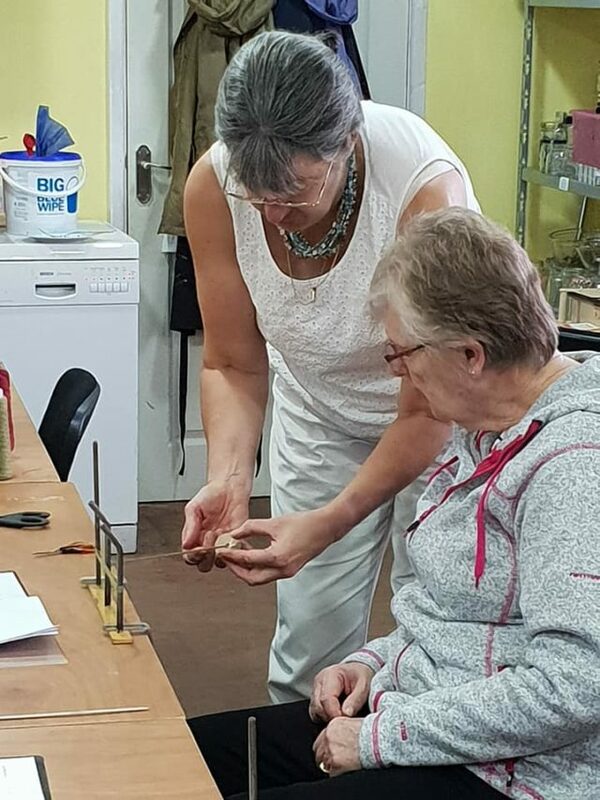 This workshop was very enlightening and demonstrated that you do not need to go out and buy the latest gadgets and materials to create a fabulous piece of art. The was Cas Holmes works shows the artist that you can use these new skills for most forms of art. Cas has demonstrated all over the world it can be of any size and shape. Thank you Cas for a fabulous two days. I would also like to thank all of the students for making it a very friendly and informal group who were happy to share ideas and encourage each other.